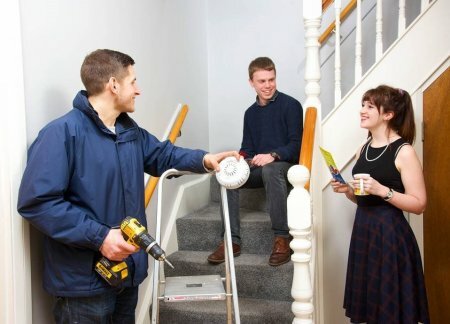 It’s been a busy week for Smart Compliance and last week (10th March 2015), we spent the day in Lancaster watching a Smart Compliance Carbon Monoxide detector being installed in a student flat. This installation was the first detector of a batch of 200 which are being fitted in student flats around Lancaster by National Grid UK. We have been working on this collaborative project with National Grid and the Energy Innovation Centre since last year, the project also includes Wales & West Utilities and Northern Gas. Ultimately it will see 600 of our units in homes across the UK. We’re delighted that the first installation of our Kitemarked units are going into student flats and will be helping to keep young people safe. For most students, moving to university and into rented accommodation, will be the first step away from their parents. They’ve got a lot to consider between paying bills, surviving on a budget, cooking and cleaning for themselves, as well as fitting in lectures, making new friends and socialising. 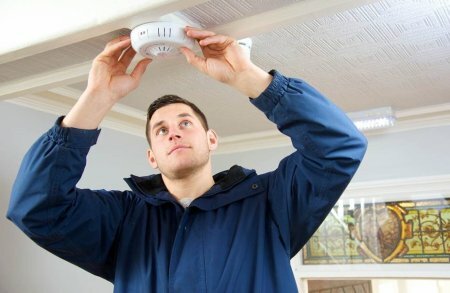 Carbon monoxide isn’t likely to be high on their list of priorities, if it’s even on their radar. And although parents will be worrying about their children, often adults are not wholly aware or informed about the dangers of carbon monoxide. Added to this, some students can find themselves at the mercy of landlords who do not keep their compliance records up-to-date. They could find themselves moving into properties that are unsafe. It can be a fair assumption that the student population can be a vulnerable sector when it comes to safety against carbon monoxide. However, we are happy when we see some organisations doing great things. This has been highlighted by Lancaster University. The Lancaster University Students Union (LUSU) is an organisation who looks after their students, finds them accommodation and ensures the properties are maintained and safe. When we visited the student flat in Lancaster, we were met by maintenance contractor Liam Reilly. The company he works for is contracted to LUSU. The upkeep of students’ properties keeps him busy and he also has the job of installing our 200 detectors. Lancaster University students Shona Thompson, 20 and James Smith, 19 have been living in their student flat since October 2014. They share their property with five other students. They admitted that they were unaware of the dangers of carbon monoxide and when leaving home and going to university, it’s not something that featured on their list of priorities. But now that they are part of our project, they are relieved safety against carbon monoxide is something that will be taken care of for them. Once the detector is in place, the students are protected and there’s nothing else they need to do. The device will self-test and send the data back to a centralised computer hub where the results are monitored, along with the reports from the other 200 devices in the area. If any raised levels of carbon monoxide are found in any property, the emergency services will be contacted. The Smart Compliance Carbon Monoxide detector means students like Shona and James are protected from CO and they don’t need to do anything. No-one living in their accommodation has the responsibility for checking the device and making sure it works. They can concentrate on other important student issues, such as fitting in all those lectures and socialising. Meanwhile for worried parents, protection against carbon monoxide is one thing they can cross off their list of concerns.